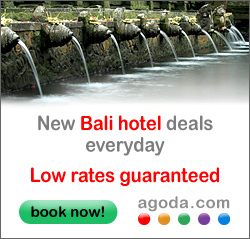 Below are some simple but useful tips that can make your vacation in Bali is running smoothly and more fun. This simple but if you fail to comply may damage your exciting holiday. Leave your important documents in your hotel safe deposit box and wandering around with the copies. Change money at a reputable looking location, check whether the commission added or not. Drink a lot of bottled water as you may dehydrated easily. Show your respect by wearing sarong when entering holy places like temple. Try not step on offerings in the street ( walk around them ). Respect the slow pace of processions, if stuck behind one don’t honk your horn! Forget to reconfirm your flight 72 hours prior to flying. Use your left hand in shaking hand or handing over something to someone as it is considered impolite. If there is no other option then express your apology. Forget to look and listen while crossing the road. Car may stop, but motorbikes may not! Touch people’s heads even children as it considers offensive. Deal in drugs. The death penalty is awaited. Swim outside designated areas on the beach. © Copyright 2013 - Sindu Bali Driver, Bali Tour Guide, Bali Tour Packages, Bali Driver Tour Service, Bali Transport Service.